In loving memory of our dear father. Angus Cormack died 31st March 1918 aged 61. 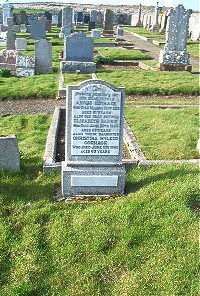 Wife Elisabeth Barnie died 20th June 1945 aged 87. Daughter Christina McLeod Cormack died 11th June 1982 aged 83.